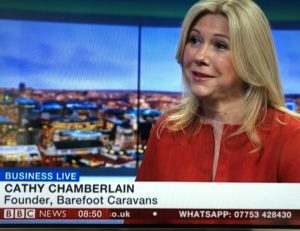 BBC TV asks Barefoot Owner: Are Caravans the new Glamping? With the trend for staycations showing no signs of abating, this was the question the BBC Business Live team posed to their viewers this week, and who better to answer it than Barefoot’s Cathy Chamberlain. 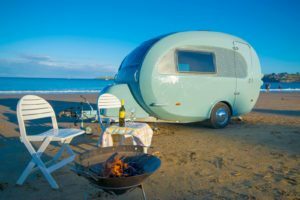 Love them or loathe them, it was clear that caravans hold an enduring place in the nation’s memories of childhood holidays, and with their increasing versatility, affordability and practicality it’s no surprise caravans are now reclaiming the top spot over tents…. with Brits now spending 15 million nights a year in their ‘home from home’. Presenter Sally Bundock asked if the trend towards smaller, tear-shaped caravans was cosmetic, but Cathy explained the aerodynamics and compact size make for a stylish and practical consideration over the ‘big boxes’ we all remember from family holidays. And that’s before you factor in the long list of creature comforts they now offer that we all crave during our unpredictable British summers! Convinced? They soon were. With the cost of a Barefoot Caravan less than half of a traditional campervan, it was clear that the opportunity of buying a new car AND the ideal festival or holiday accommodation made sense for canny Brits looking for ways to make the most of British summer staycations and our vibrant festival circuit. To see the whole interview go to BBC i player 26th April – about 15 minutes into the programme. 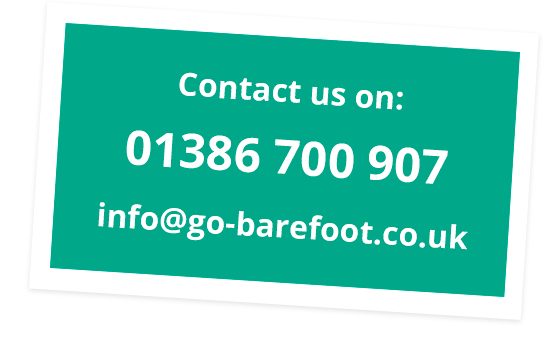 To find out more, go to www.go-barefoot.co.uk or email info@go-barefoot.co.uk.